Sometimes people don't want just to give money to a cause; they want to organize, points out Emily Blistein. "I found myself saying one too many times: 'There just must be something I could do,'" she says. She's talking about gun violence in the U.S. It's not a topic you'd expect to hear about in Blistein's charming boutique, Clementine, in Middlebury. The 5-year-old shop is filled with unique new and vintage items, from stationery to home décor to baby clothes. Yet, Blistein says, "I have these intense conversations with people in the store throughout the week — especially moms." A mother to one boy and stepmother to two, she adds, "There has been an underlying tremor to each day as I drop my son off at school." And, as a former attorney who worked with victims of domestic abuse, Blistein knows something about rallying for a cause. "In December, in the wake of the San Bernardino shootings, I was really tired of doing nothing," Blistein says, "and realized that one of my strongest skill sets is cheerleading for others' creativity and organizing it into a focused effort." So she found a way to marry her love for design and her concern about the violence that killed nearly 10,000 Americans and injured more than 20,000 in 2015 alone. 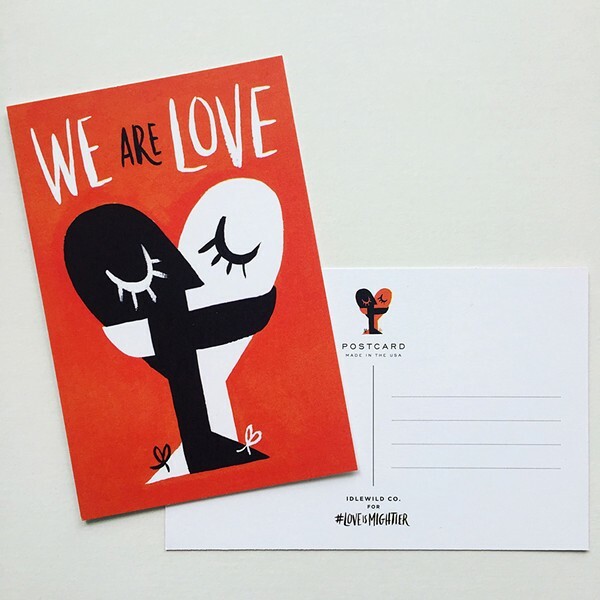 Her new artist-designed postcards spread the message "Love Is Mightier." 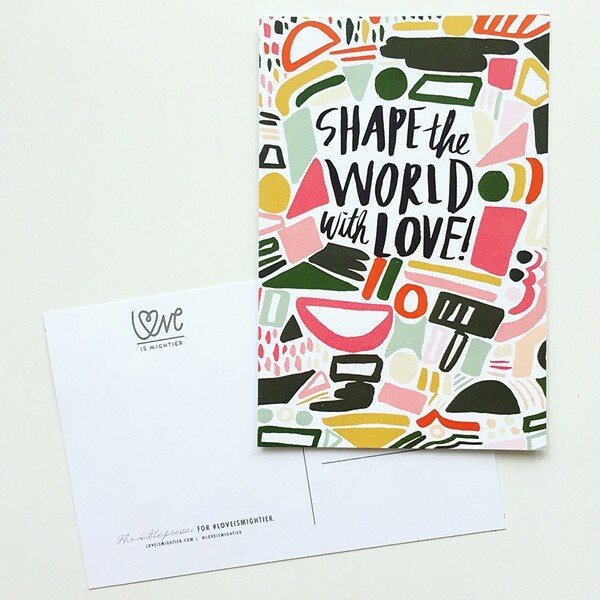 Blistein, who contributes to the blog Oh So Beautiful Paper and counsels Etsy crafters on their marketing skills, says, "I put out a call on my Instagram feed and said, 'Call me if you're interested.' More than 50 said they'd love to do it." Blistein accomplished her goal of getting the first batch of 100 cards — sold in packs of 10 — ready for a soft launch for Valentine's Day. "There will be at least three sets, based on designs I already have," she says; the other two will be available by mid-March. Each pack sells for $10, and 100 percent of proceeds will be donated to "organizations working to end gun violence." The simplest card has just the word "love" written in red cursive on a white background. Others use a slogan and graphic designs. 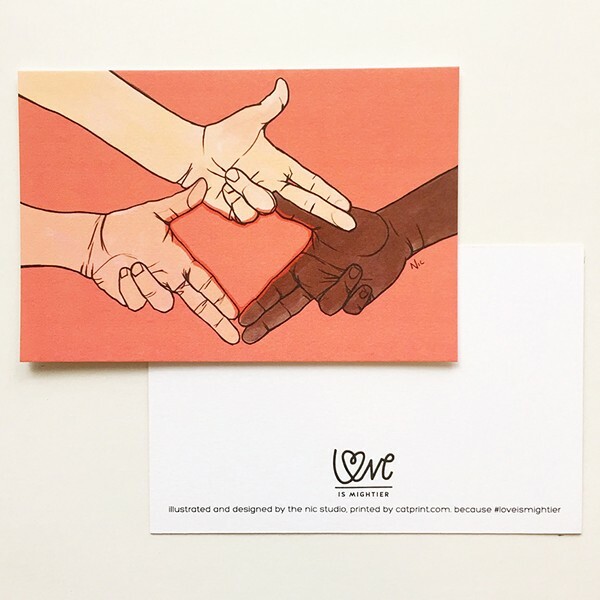 One has no words, only three hands — of different skin tones — coming together to form a heart shape. "I love the public aspect of [the cards] going through the mail; everyone can seem them," Blistein says. "I put #loveismightier on the back so other people can share — people may choose to take pictures of the messages they get on the cards." The social-media maven has also created a website, and an Instagram account for the project. The original print version of this article was headlined "Love Is in the Mail"